Muncie /ˈmʌnsi/ is an incorporated city and the seat of Delaware County, Indiana. It is located in East Central Indiana, about 50 miles (80 km) northeast of Indianapolis. The United States Census for 2010 reported the city's population was 70,085. It is the principal city of the Muncie metropolitan statistical area, which has a population of 117,671. 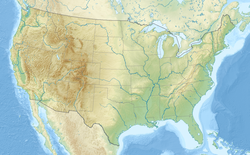 The area was first settled in the 1790s by the Lenape (Delaware) people, who migrated west from their tribal lands in the Mid-Atlantic region (all of New Jersey, southeastern New York, eastern Pennsylvania, and northern Delaware) to new lands in present-day Ohio and eastern Indiana. The Lenape founded several towns along the White River, including Munsee Town, near the site of present-day Muncie. In 1818 the area's native tribes ceded their lands to the federal government under the terms of the Treaty of St. Mary's and agreed to move farther west by 1821. New settlers began to arrive in what became Delaware County, Indiana, about 1820, shortly before the area's public lands were formally opened for purchase. The small trading village of Munsee Town, renamed Muncietown, was selected as the Delaware County seat and platted in 1827. 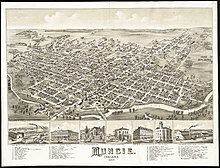 On January 13, 1845, Indiana's governor signed legislation passed by the Indiana General Assembly to shorten the town's name to Muncie. Soon, a network of roads connected Muncie to nearby towns, adjacent counties, and to other parts of Indiana. The Indianapolis and Bellefontaine Railroad, the first to arrive in Muncie in 1852, provided the town and the surrounding area with access to larger markets for its agricultural production, as well as a faster means of transporting people and goods into and out of the area. Muncie incorporated as a town on December 6, 1854, and became an incorporated city in 1865. John Brady was elected as the city's first mayor. Muncie's early utility companies also date to the mid-1860s, including the city's waterworks, which was established in 1865. After the American Civil War, two factors helped Muncie attract new commercial and industrial development: the arrival of additional railroads from the late 1890s to the early 1900s and the discovery of abundant supplies of natural gas in the area. Prior to the discovery of nearby natural-gas wells and the beginning of the gas boom in Muncie in 1886, the region was primarily an agricultural area, with Muncie serving as the commercial trading center for local farmers. The Indiana gas boom of the 1880s ushered in a new era of prosperity to Muncie. Abundant supplies of natural gas attracted new businesses, industries, and additional residents to the city. Although agriculture continued to be an economic factor in the region, industry dominated the city's development for the next 100 years. One of the major manufacturers that arrived early in the city's gas-boom period was the Ball Brothers Glass Manufacturing Company, which was renamed the Ball Corporation in 1969. The Ball brothers, who were searching for a new site for their glass manufacturing business that was closer to an abundant natural-gas supply, built a new glass-making foundry from in Muncie, beginning its glass production on March 1, 1888. In 1889 the company relocated its metal manufacturing operations to Muncie. In addition to several other glass factories, Muncie attracted iron and steel mills, including the Republic Iron and Steel Company and the Midland Steel Company. (Midland became Inland Steel Company and later moved to Gary, Indiana.) Indiana Bridge Company was also a major employer. By the time the natural gas supply from the Trenton Gas Field had significantly declined and the gas boom ended in Indiana around 1910, Muncie was well established as an industrial town and a commercial center for east-central Indiana, especially with several railroad lines connecting it to larger cities and the arrival of automobile industry manufacturing after 1900. Numerous civic developments also occurred as a result of the city's growth during the 1870s, 1880s, and 1890s, when Muncie citizens built a new city hall, a new public library, and a new high school. The city's gasworks also began operations in the late 1870s. The Muncie Star was founded in 1899 and the Muncie Evening Press was founded in 1905. A new public library, which was a Carnegie library project, was dedicated on January 1, 1904, and served as the main branch of the city's public library system. The forerunner to Ball State University also arrived in the early twentieth century. Eastern Indiana Normal School opened 1899, but it closed after two years. Several subsequent efforts to establish a private college in Muncie during the late nineteenth and early twentieth centuries also failed, but one proved to be very successful. After the Ball brothers bought the school property and its vacant buildings and donated them to the State of Indiana, the Indiana State Normal School, Eastern Division, the forerunner to Ball State University, opened in 1918. It was named Ball Teachers College in 1922, Ball State Teachers College in 1929, and Ball State University in 1965. Beginning in the late nineteenth century, in tandem with the gas boom, Muncie developed an active cultural arts community, which included music and art clubs, women's clubs, self-improvements clubs, and other social clubs. Hoosier artist J. Ottis Adams, who came to Muncie in 1876, later formed an art school in the city with fellow artist, William Forsyth. Although their school closed with a year or two, other art groups were established, most notably the Art Students' League (1892) and the Muncie Art Association (1905). By the early twentieth century several railroads served Muncie, which helped to establish the city as a transportation hub. The Cincinnati, Richmond and Muncie Railroad (later known as the Chesapeake and Ohio Railway) reached Muncie in 1903. The Chicago, Indiana, and Eastern Railroad (acquired by a subsidiary of the Pennsylvania Railroad system) and the Chicago and Southeastern (sometimes called the Central Indiana Railroad) also served the city. In addition to the railroads, Muncie's roads connected to nearby towns and an electric interurban system, which arrived in the early 1900s, linked it to smaller towns and larger cities, including Indianapolis and Fort Wayne, Indiana, and Dayton, Ohio. With the arrival of the auto manufacturing and the related auto parts industry after the turn of the twentieth century, Muncie's industrial and commercial development increased, along with its population growth. During World War I local manufacturers joined others around the county in converting their factories to production of war material. In the 1920s Muncie continued its rise as an automobile-manufacturing center, primarily due to its heavy industry and skilled labor force. During this time, the community also became a center of Ku Klux Klan activity. Muncie's Klan membership was estimated at 3,500 in the early 1920s. Scandals within the Klan's leadership, divisions among its members, and some violent confrontations with their opponents damaged the organization's reputation. Increasing hostility toward the Klan's political activities, beliefs, and values also divided the Muncie community, before its popularity and membership significantly declined by the end of the decade. Muncie residents also made it through the challenges of the Great Depression, with the Ball brothers continuing their role as major benefactors to the community by donating funds for construction of new facilities at Ball State and Ball Memorial Hospital. 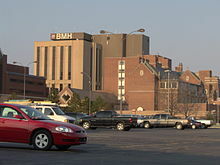 (The hospital, which opened in 1929, later affiliated with Indiana University Health.) The Works Progress Administration (WPA) also provided jobs such as road grading, city sewer improvements, and bridge construction. In the 1920s, Robert and Helen Lynd led a team of sociologists in a study of a typical middle-American community. The Lynds chose Muncie as the locale for their field research, although they never specifically identified it as "Middletown" the fictional name of the town in their study. Muncie received national attention after the publication of their book, Middletown: A Study in Contemporary American Culture (1929). The Lynds returned to Muncie to re-observe the community during the Depression, which resulted in a sequel, Middletown in Transition: A Study in Cultural Conflicts (1937). The Lynds' Middletown study, which was funded by the Rockefeller Institute of Social and Religious Research, was intended to study "the interwoven trends that are the life of a small American city." The Lynds were only the first to conduct a series of studies in Muncie. The National Science Foundation funded a third major study that resulted in two books by Theodore Caplow, Middletown Families (1982) and All Faithful People (1983). Caplow returned to Muncie in 1998 to begin another study, Middletown IV, which became part of a Public Broadcasting Service documentary titled "The First Measured Century", released in December 2000. The Ball State Center for Middletown Studies continues to survey and analyze social change in Muncie. A database of Middletown surveys conducted between 1978 and 1997 is available online from the Association of Religion Data Archives (ARDA). 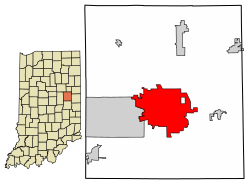 Due to the extensive information collected from the Middletown studies during the twentieth century, Muncie is said to be one of the most studied cities of its size in the United States. In addition to being called a "typical American city", as the result of the Middletown studies, Muncie is known as Magic City or Magic Muncie, as well as the Friendly City. During World War II the city's manufacturers once again turned their efforts to wartime production. Ball State and Muncie's airport also trained pilots for the U.S. Navy. The postwar era was another period of expansion for Muncie, with continued growth and development of industries, construction of new homes, schools, and businesses. A population boom brought further development, especially from 1946 to 1965. Since the 1950s and 1960s Muncie has continued as an education center in the state and emerged as a regional health center. As enrollment at Ball State increased, new buildings were erected on the college's campus. Ball Memorial Hospital also expanded its facilities. However, by the 1960s, industrial trends had shifted. Beginning in the 1970s several manufacturing plants closed or moved elsewhere, while others adapted to industrial changes and remained in Muncie. Ball Corporation, for example, closed its Muncie glass manufacturing facilities in 1962 and its corporate headquarters relocated to Broomfield, Colorado in 1998. Muncie was also home to other manufacturing operations, including Warner Gear (a division of BorgWarner), Delco Remy, General Motors, Ontario Corporation, A. E. Boyce Company, and Westinghouse Electric, among others. According to the 2010 census, Muncie has a total area of 27.392 square miles (70.94 km2), of which 27.2 square miles (70.45 km2) (or 99.3%) is land and 0.192 square miles (0.50 km2) (or 0.7%) is water. Muncie has a humid continental climate (Köppen climate classification Dfa) experiencing four distinct seasons. Muncie has over 50 identified neighborhoods. As of the census of 2010, there were 70,085 people, 27,722 households, and 13,928 families residing in the city. The population density was 2,576.7 inhabitants per square mile (994.9/km2). There were 31,958 housing units at an average density of 1,174.9 per square mile (453.6/km2). The racial makeup of the city was 84.0% White, 10.9% African American, 0.3% Native American, 1.2% Asian, 0.1% Pacific Islander, 0.8% from other races, and 2.8% from two or more races. Hispanic or Latino of any race were 2.3% of the population. There were 27,722 households of which 23.9% had children under the age of 18 living with them, 31.5% were married couples living together, 14.1% had a female householder with no husband present, 4.6% had a male householder with no wife present, and 49.8% were non-families. 35.2% of all households were made up of individuals and 10.9% had someone living alone who was 65 years of age or older. The average household size was 2.22 and the average family size was 2.85. The median age in the city was 28.1 years. 17.8% of residents were under the age of 18; 27.5% were between the ages of 18 and 24; 21.4% were from 25 to 44; 20.2% were from 45 to 64; and 13% were 65 years of age or older. The gender makeup of the city was 47.5% male and 52.5% female. As of the census of 2000, there were 67,430 people, 27,322 households, and 14,589 families residing in the city. The population density was 2,788.2 people per square mile (1,076.7/km²). There were 30,205 housing units at an average density of 1,248.9 per square mile (482.3/km²). The racial makeup of the city was 83.72% White, 12.97% African American, 0.27% Native American, 0.79% Asian, 0.09% Pacific Islander, 0.67% from other races, and 1.49% from two or more races. Hispanic or Latino of any race were 1.44% of the population. There were 27,322 households out of which 23.7% had children under the age of 18 living with them, 36.4% were married couples living together, 13.0% had a female householder with no husband present, and 46.6% were non-families. 34.1% of all households were made up of individuals and 11.8% had someone living alone who was 65 years of age or older. The average household size was 2.24 and the average family size was 2.86. In the city, the age distribution of the population shows 19.8% under the age of 18, 24.6% from 18 to 24, 24.2% from 25 to 44, 18.3% from 45 to 64, and 13.2% who were 65 years of age or older. The median age was 29 years. For every 100 females, there were 89.9 males. For every 100 females age 18 and over, there were 86.5 males. The median income for a household in the city was $26,613, and the median income for a family was $36,398. Males had a median income of $30,445 versus $21,872 for females. The per capita income for the city was $15,814. About 14.3% of families and 23.1% of the population were below the poverty line, including 24.2% of those under age 18 and 9.7% of those age 65 or over. The Ball brothers, industrialists and founders of Ball Corporation, were influential in the city's civic and economic development. Muncie has attracted some new manufacturers, while older factories have been converted to other industrial uses. In 2009, Muncie became the U.S. headquarters for Brevini Wind, an Italian-based company that manufactures gearboxes for wind turbines. In 2011, locomotive maker Progress Rail (a subsidiary of Caterpillar Inc) opened in a former Westinghouse facility that had been vacant since 1998. IU Health Ball Memorial Hospital is Muncie's largest employer. The visitor center for the Cardinal Greenway occupies the restored Cincinnati, Richmond, & Muncie Depot. The David Owsley Museum of Art collection, which includes over 11,000 works, has been in the Fine Arts Building on the Ball State University campus since 1935. The Horizon Convention Center, located downtown, offers 47,000 square feet (4,400 m2) of exhibition space and houses the Muncie Children's Museum. The city also has a large group of independent art galleries. Three of the city's largest performing arts centers belong to Ball State University: the 3,581-seat Emens Auditorium, the 600-seat Sursa Performance Hall, and the 410-seat University Theatre. Downtown performing arts spaces include the Muncie Civic Theatre and Canan Commons, an outdoor amphitheater and greenspace that opened in 2011. In addition, the Muncie Ballet and the Muncie Symphony Orchestra are prominent in the city's arts community. Minnetrista Cultural Center, just north of downtown along the White River, is a cultural heritage museum featuring exhibits and programs focusing on nature, east-central Indiana history, and art. The 40-acre (16-hectare) campus includes historic homes that were once owned by the Ball family, themed gardens, outdoor sculptures, and a portion of the White River Greenway. The Cardinal Greenway, Indiana's longest rail trail project, stretches 60 miles (97 km) from Richmond to Marion, Indiana. Designated a National Recreation Trail in 2003, it is part of the American Discovery Trail. The Ball State campus is home to Christy Woods, an 18-acre (7.3-hectare) arboretum, three greenhouses, and the Wheeler Orchid Collection and Species Bank. Muncie's music scene has been home to such acts as Brazil, Everything, Now!, and Archer Avenue (ex-Margot & the Nuclear So and So's). Muncie also hosts several local music festivals, including Muncie Gras and Muncie MusicFest. Muncie also has a network of craft beer enthusiasts. Muncie is home to the NCAA Division I Ball State Cardinals which is a member of the Mid-American Conference. Notable sports include football (played at Scheumann Stadium), men's basketball (played at John E. Worthen Arena), and baseball (played at Ball Diamond). Muncie was once home to the Muncie Flyers, also known as the Congerville Flyers, the city's professional football team from 1905 to 1925. The Muncie team was one of the eleven charter members of National Football League (NFL). It played in the league from 1905 to 1925. Muncie was also home to the Muncie Flyers, a minor league hockey team. The team played in the International Hockey League for a single season in 1948–1949. As part of the Indianapolis market, Muncie receives Indianapolis' network affiliates. East Central Indiana's PBS member station, WIPB, is located in Muncie. The Joy of Painting was filmed at WIPB. Fort Wayne International Airport at 74.4 miles (119.7 km) and Indianapolis International Airport at 75.4 miles (121.3 km) are the nearest commercial airports. Muncie Indiana Transit System (MITS) provides 14 fixed bus routes daily, except Sundays. Note: This list does not include Ball State University graduates. Please see List of Ball State University alumni for notable alumni. Francis Focer Brown, American impressionist painter that also served as the head of the Fine Arts Department at and the David Owsley Museum of Art at Ball State University. ^ Huppke, Rex (April 27, 2003). "Day of prayer turning into day of discord". Chicago Tribune. Chicago. Retrieved November 7, 2016. ^ Roysdon, Keith; Walker, Douglas (2016). Wicked Muncie. The History Press. ISBN 978-1-43965-665-5. ^ Lasley, Norma (2012). "Muncie". Delaware County. Arcadia Publishing. p. 57. ISBN 978-0-7385-9430-9. ^ Younge, Gary (November 11, 2016). "How Trump took middle America". The Guardian. London. Retrieved November 16, 2016. ^ "Indianapolis, Indiana to Muncie, Indiana". Google. Retrieved 2015-06-25. ^ "Delaware County QuickFacts". United States Census Bureau. Archived from the original on 2011-07-09. Retrieved 2011-09-17. ^ "Center for Middletown Studies". Ball State University. Retrieved 2013-07-17. ^ According to an historical map of "The Indians" by Clark Ray. ^ Richard A. Greene (1965). Muncie and Delaware County: An Historical Sketch. Muncie, Indiana: Delaware County Historical Society. p. 15. ^ a b c Greene, pp. 15–16. ^ Wiley W. Spurgeon & H. Duane Harrison (1984). Muncie and Delaware County: An Illustrated Retrospective. Woodland Hills, California: Windsor Publications. pp. 23–24. ISBN 0897811046. ^ Greene, pp. 7–6 and 15–16. ^ William Harrison Kemper (1908). A Twentieth Century History of Delaware County, Indiana. Lewis Publishing Company. p. 113. ^ Greene, pp. 9, 13. ^ a b c Spurgeon, p. 27. ^ Muncie of To-Day: Its Commerce, Trade and Industries, Descriptive and Historical (reprint ed.). Mt. Vernon, Indiana: Windmill Publications. 1999. p. 5. OCLC 41400603. ^ Dwight W. Hoover (1980). A pictorial history of Indiana. Indiana University Press. ISBN 9780253146939. ^ a b Greene, p. 11. ^ By the mid-1940s the two newspapers were under common ownership. See Spurgeon, p. 47. ^ "Ball State University: History and Mission". Ball State University. Retrieved 2012-11-06. ^ Ned H. Griner (1985). Side By Side With Coarser Plants: The Muncie Art Movement, 1885–1985. Muncie, Indiana: Ball State University. pp. 6–9, 13–14, 23, 37. OCLC 13211261. ^ Spurgeon, pp. 50, 55. ^ Dwight W. Hoover (1986). Magic Middletown. Bloomington: Indiana University Press. pp. 96–100. ISBN 9780253285904. ^ a b c Spurgeon, p. 63. ^ Robert S. Lynd & Helen M. Lynd (1929). Middletown, A Study in Contemporary American Culture. Harcourt, Brace and Company. p. 3. OCLC 885209. ^ "Center for Middletown Studies". Ball State University. Retrieved 2016-04-06. ^ "Online Tools". Association of Religious Data Archives. Retrieved 2016-04-06. ^ Spurgeon, pp. 82, 92–94, 114–15. ^ a b Spurgeon, pp. 90–98, 103, 110–14, 128–29. ^ Indiana Code. "Title 36, Article 4, Section 1". IN.gov. Retrieved 2 February 2019. ^ Office of the Mayor. "Mayor". City of Muncie. Retrieved 2 February 2019. ^ City of Muncie. "Muncie City Council". City of Muncie. Retrieved 2 February 2019. ^ Ohlenkamp, Corey (26 February 2019). "Democrats select Denise Moore as Quirk's replacement on city council". The Star Press. Retrieved 26 February 2019. ^ "National Weather Service Climate". NOWdata. June 2014. ^ "Muncie, Indiana Climate Information and Data". Homefacts.com. July 2013. ^ "American FactFinder". U.S. Census Bureau. Retrieved 2015-02-18. ^ a b Paul Davidson (2011-05-09). "Two Indiana cities symbolize both sides of uneven jobs recovery". USA Today. Retrieved 2013-07-17. ^ "Muncie IN". Forbes. 2012. Retrieved 2013-07-13. ^ a b Hagerty, James (2012-03-18). "As Unions Lose Their Grip, Indiana Lures Manufacturing Jobs". The Wall Street Journal. Archived from the original on July 1, 2014. Retrieved 2013-07-17. ^ "Progress Rail Announces Grand Opening of Muncie, Indiana Locomotive Assembly Operation". PR Newswire. 2011. Retrieved 2013-07-17. ^ Robin Gibson (3 May 2014). "LOST MUNCIE: Current, former Muncie residents revisit the past online". The Star Press. Archived from the original on 4 May 2014. Retrieved 4 May 2014. ^ Mary Williams Walsh (2000-04-19). "'New economy' deepens the wealth divide". Los Angeles Times. Retrieved 2015-06-25. ^ "Muncie Mayor Election: The final vote". Muncie Free Press. 2011-11-06. Archived from the original on May 4, 2014. Retrieved 2013-07-14. ^ Ron Fournier (2012-04-19). "In Nothing We Trust". National Journal. Retrieved 2013-07-13. ^ Seth Slabaugh (2 May 2014). "Where have all the college grads gone?". The Star Press. Archived from the original on 4 May 2014. Retrieved 4 May 2014. ^ "MDDP Accomplishments & Awards". MDDP. 2012. Archived from the original on 2014-05-04. Retrieved 2014-05-04. ^ "Muncie Tops Most Affordable College Town List". Inside Indiana Business. 2007-11-06. Archived from the original on 2014-05-04. Retrieved 2013-07-17. ^ "Best Small Places For Businesses and Careers List". Forbes. Retrieved April 17, 2016. ^ Roysdon, Keith. "Scotty: 'Really excited' for Muncie restaurants". Dine and Dash. The Star Press. Retrieved April 17, 2016. ^ "Major Employers". Muncie–Delaware County Economic Development Alliance. 2016. Retrieved May 25, 2016. ^ "About Us". Horizon Convention Center. Archived from the original on 2015-02-21. Retrieved 2015-04-07. ^ "Muncie Indiana Center Visitors Bureau". Muncie Visitors Bureau. Archived from the original on May 5, 2014. Retrieved 2014-05-04. ^ "About Emens". Ball State University. Retrieved 2013-07-14. ^ "Sursa Performance Hall". Ball State University. Retrieved 2013-07-14. ^ "Downtown Muncie, Muncie Gras". MDDP. Archived from the original on 2014-05-04. Retrieved 2014-05-04. ^ "Muncie MusicFest". Muncie MusicFest. Retrieved 2014-05-04. ^ "TURNING A CORNER: Sean Brady's brewery up and running". The Star Press. Archived from the original on 2014-05-04. Retrieved 2014-05-04. ^ "History of the Muncie Flyers Football team". Retrieved 2012-08-25. ^ Muncie Indiana Transit System. "Routes & Schedules". MITS. Archived from the original on 2015-06-26. Retrieved 2015-06-25. ^ "Chicago Ceremony Links Muncie – Zhuji City". Muncie–Delaware County, Indiana Economic Development Alliance. Archived from the original on 2010-06-05. Retrieved 2013-07-12. ^ "The Life and Times of George Dale, Muncie Mayor and Editor". Ball State University. Retrieved 2012-08-25. ^ "Bertha Fry, World's 3rd Oldest Person, Dies in Muncie". Archived from the original on 2014-07-01. Retrieved 2012-08-25. ^ Griner, pp. 7–9 and 13–14. ^ "Gallery Talk with Marc Dennis, Cheryl Anne Lorance". CorningFingerLakes.com. January 18, 2013. Retrieved March 15, 2018. Wikimedia Commons has media related to Muncie, Indiana. Chisholm, Hugh, ed. (1911). "Muncie" . Encyclopædia Britannica (11th ed.). Cambridge University Press. LIFE Magazine May 10, 1937, "Middletown-Muncie", pages 15–25, ("the Picture Essay"), at Google Books.